Oftentimes, Father Kunst’s story of the purchase of an item is as interesting as the purchase itself. 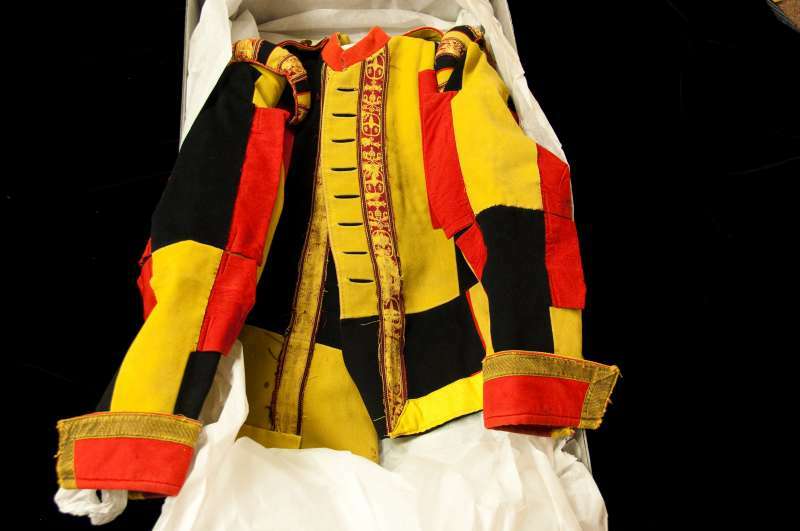 The Swiss Guard uniform dating to Pope Leo XIII’s pontificate is one of them. This is an extremely rare item and he was very excited about the prospect of owning it. He saw the uniform for sale on e-Bay but was unable to communicate with the seller. Father Kunst is very leery about buying anything without contact with the seller. Since there was no response to his questions he did not bid on the uniform. Three weeks later he received an e-mail from the owner of the uniform. It turned out that she had donated it to her niece for a fundraiser at her high school. The niece had no idea how to answer Father’s questions, so she did not respond to his e-mail. In the meantime the owner of the uniform did a google search looking for Swiss Guard items or pope items. She thought this would help her to research her uniforms. She owned a costume store and had recently bought several items from another costume store dating to the late 1800s. Among the items she bought were several uniforms which she thought were merely costumes for a play. The reason she was researching her items was because the one uniform that sold on eBay went for a much higher price than she anticipated. She found Father Kunst during her research and did not know he was the person attempting to communicate with her. Their ensuing conversation revealed their mutual interest in the uniforms. She found Father Kunst on line because of several articles about him and his Vatican collection. When she discovered that he was an expert she ask him about the uniforms. He told her they were authentic and gave her advice about selling them. Meanwhile, she contacted the Swiss Guard at the Vatican to find out if Father Kunst was legitimate and trustworthy. They assured her he was. Her interaction with the Swiss Guard was actually another opportunity for him to deepen his connection with them. Father Kunst was able to connect the seller to another purchaser who bought a couple of the uniforms at a very good price. Father Kunst also purchased this uniform thereby extending his collection of significant Swiss Guard items. The uniform is very rare and even rarer is the intriguing story connected to it.